When players want to relive the glory days of Las Vegas and Monaco, they play a round of Bars & Sevens. This intensely colourful game will light up your gaming experience, putting you at the centre of something truly extraordinary. Boasting intense primary colours that appeal to your senses, Bars & Sevens strives to replicate the feeling of being at the centre of it all. Developed by the masterminds at Novomatic casino, Bars & Sevens boasts an allure that is unlike any other. 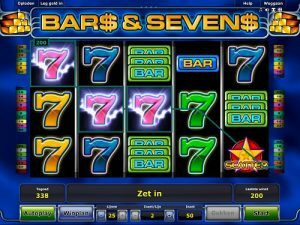 Those who enjoy slots such as 4 Reel Kings, Bar 7s and 5 Line Multiplay will definitely get into the groove of this game. With all of the classic slot symbols you have come to know and love over the years, this slot is certain to light a fire within your spirit. Revel in the joy that only old-school slots can provide, warming your spirit as you lay it all down on the line. Even if you are usually a fan of games with newer themes—such as Bear Tracks, Big Runner, Dolphins Pearl Deluxe and Blazing Riches—you are going to get a big kick out of this game. Not only does it boast phenomenal graphics, but the marvellous music will also sweep you away with its glitz and glamour. If you're looking with a slot game with a sparkling scatter that will set your heart racing, then look no further. Bars & Sevens excels at adding those extra special touches that will make you want to come back and keep playing the game. It doesn't matter if you regularly enjoy Bella Donna, Book of Ra Deluxe, Beetle Mania, Big Catch or Armadillo Artie; it is very likely that Bars & Sevens will become your new favourite. Wielding its own kind of special charm, this slot is a delight for everyone who happens upon it. Although this slot does possess more of a vintage vibe, it's still equipped with all of the tremendous trappings of an advanced modern game. After all, when you're swept up in the moment, you don't want to have to keep pressing the start button. With Bars & Sevens, just hit Autostart and call it a day! Keep the party going for as long as you'd like, and remember that you choose the way you play. Whether you want to go for more lines or play less aggressively, it's all up to you. If you happen to win, then you may decide to seek out the Gamble option and see if you can double your winnings. When you're playing Bars & Sevens, anything is possible. Gold Piled in the Corners of This Sensational Slot—Will It Be Yours? There's something about the colour scheme in this game that is so appealing and extraordinary. As you start to play the game, you will immediately become enveloped in its green and blue glory. If you happen to see those triple Bar symbols pop up onto the reels, then you will know that perhaps you're in the running for a gold rush. In this game, everything is out in the open and available for you to see. In fact, you will even be able to see what you won on the last round. Take a look at all your credits and see what you might feel comfortable wagering; there are so many ways to win that you will be entranced and transported every time you sit down for a session. When you're playing slots, it is important to play a game that appeals to you on all levels. With its stunning simplicity and good, old-fashioned charm, Bars & Sevens is a game that is ultimately appealing to people from all walks of life. For both seasoned slots players and beginners, there is so much to love about this slot. Allow it to become part of your repertoire and you may be surprised by how much it contributes to the happiness you feel while playing. Sometimes you just want an escape and you don't want to spend a ton of time figuring out complex rules. For these times, logging on and playing Bars & Sevens is essential. Strike up a fun balance in your life by checking out Bars & Sevens; you won't regret it! Filled with endless enjoyment, this is a spectacular slot game that you can keep coming back to you whenever you're looking for the ultimate in entertainment.